We are not just proud of the work we do, we are proud of how we do it. Unveiled Moments is a group of highly talented professional photographers who all believe that a moment is just a moment until it passes and becomes simply a memory. Moments are often times missed before you even knew they happened. We are here to capture these moments and unveil them for you. We pride ourselves on not just the work we do but the way we do it. We strive to provide you with not just the best quality images but an experience that you will never forget. This is true creative storytelling at its best. Unveiled Moments has evolved from the former name "Unveiled Events". With this evolutionary step forward we have raised the bar in quality imagery, customer service and the widest range of customizable options. Growing up in the San Francisco Bay Area, Alex Wells fell in love with photography, especially the way it can be used to tell a story. Attending Brooks Institute of Photography, Alex was taught by some of the most widely recognized photographers in the world. After graduating with a Bachelor of Arts Degree in Professional Photography, Alex set forth on an international photo excursion around the world for the next year. While traveling, he honed his skills and developed his own personal style of photojournalism. 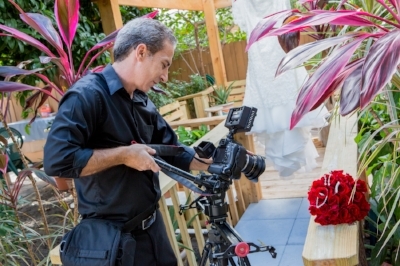 Shortly after moving to Florida, Alex started working as a wedding photographer and found the ideal way for him to use his skills. As Alex learned the business of photography, he developed company that ran not just solely on great photography but one that functions on a strong belief that the client always comes first. That is the company you now see today. Melissa is a visual designer originally from Colombia who moved to here to pursue her studies in advertising, graphic design and photography. She currently lives in Delray Beach; where she has dedicated herself to assist Alex in taking care of clients, design work and the marketing management side of the company while bringing a soft feminine touch to the mix. She is very observant and always makes sure to keep the business and the family in smooth working order -She also likes to pretend she is in charge. If Unveiled Moments was a ship then she would certain be the anchor, keeping everyone on schedule and from loosing their minds from time to time. A second generation photographer, Erik Lieux began his path towards professionally photographing over 10 years ago, and is enjoying every minute of it. His photography has also been featured in various journals and publications with imagery featured on the cover of Miami Beach Magazine. Known by clients for his professionalism and warm demeanor, Erik believes the photo experience, from start to finish should provide clients with an experience that is both enjoyable and memorable while capturing the magic of the moment, forever. 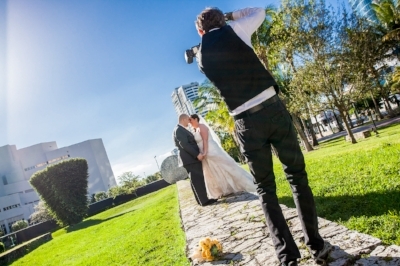 We consider ourselves to be a photographic storytellers, telling your wedding story. Our mission is for your images to be authentic, full of vibrant life, romance, emotion, and playfulness. We do our best to be as unobtrusive as possible while capturing the reality of the event allowing us to get all of those little moments that just unfold as naturally as possible. We will capture your images into a seamless collection that tells a story with creativity and timeless beauty. We prefer working with natural light because it creates pure, authentic images but when that’s not possible we always have a professional lighting assistant who's job is to create lighting that gives that same feel and effect as the natural light would. This lighting is one of the main things separates us from the competition. We often use this lighting to separate our subject from the background making for a stunning result. This lighting can also be used to isolate and focus on a single subject allows us to capture the affection between the wedding couple. We strive to preserve the true beauty and emotion of every event and make sure our clients always look there best. Unveiled Moments is proud of our community Delray Beach, which has been our home for the past 5 years. Our office is located in the heart of Delray Beach only two blocks from Atlantic Ave. There is an expression, “don’t take your work home with you”, that is a notion that we just couldn’t do. We are located in the Coda townhomes and have remodeled the first floor of into the perfect office for meeting clients and displaying our work. We would like to invite you to our home where we can discuss all the details about your big day. Want some coffee, tea or how about a nice glass wine and cheese. Whatever your in the mood we can provide. Come on over and say hello to your new photographers.